How many photos of the moon can you take without getting bored? A bunch; I've been shooting the moon (*cough*) for a couple years, now, and it's still a fun challenge each time I try again. Next question: How many can you show at once without getting repetitive? It depends. I've got four here, but I think they're sufficiently unique to tell different stories about the world. And to try something different, I'm going to explain how I found each angle, and what I liked about the resulting images. I was walking to my car Monday evening when I noticed the colorful juxtaposition of light from a yellow parking lot arc-lamp with the white of the moon shining in the dark sky. I was dumbstruck, really. I pulled out my camera and tripod and started shooting. The above was pretty much a throw-away shot. 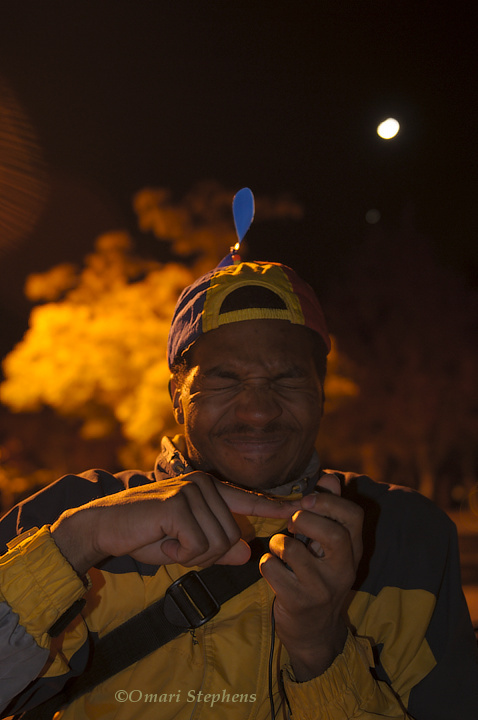 I had finished shooting, and was just working on getting the framing I wanted for some self-portraits. Even ignoring the circumstances, though, I am floored by how well it came out; it's definitely my favorite of the bunch. I think what I like most is how the foreground sort of fades to a deep black, where you suddenly find the Moon and Jupiter. I'm not totally sure, really, but it definitely tickles my fancy. Going back to the beginning of the night, this was one of my first successful images. 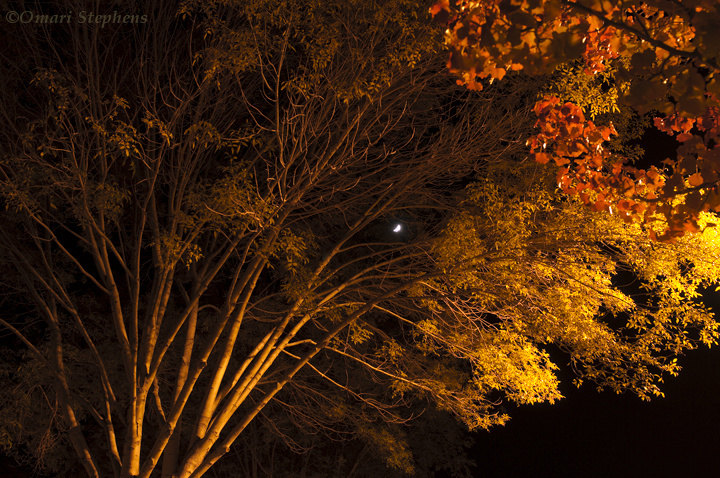 I started off trying to find a view of the moon through the red-leaved tree (the one to the top-right of this frame), and when that wasn't working, I moved to this tree with the yellow leaves. One thing I liked about this tree is the foliage — it's dense on the fringes, but the central leaves appear to already have fallen for the winter. I tried to find a composition that emphasized this, and I think what I ended up with works well. The detail in the branches is great, and the location of the moon sort of draws your eyes in that direction, but the arc lamp off to camera-right keeps you from forgetting about the foliage that's still around. After trying out a couple other things on the yellow tree, I went back to try the first again. Instead of focusing on the red leaves and trying to keep the arc lamp in the frame, this time I shot through the red tree with a long focal length (narrow field of view), and used the red leaves more as supporting elements than as the focus of the image. This worked a lot better. I like how the combination of shadows and rapid light falloff creates a palette of reds of different hues and darknesses. 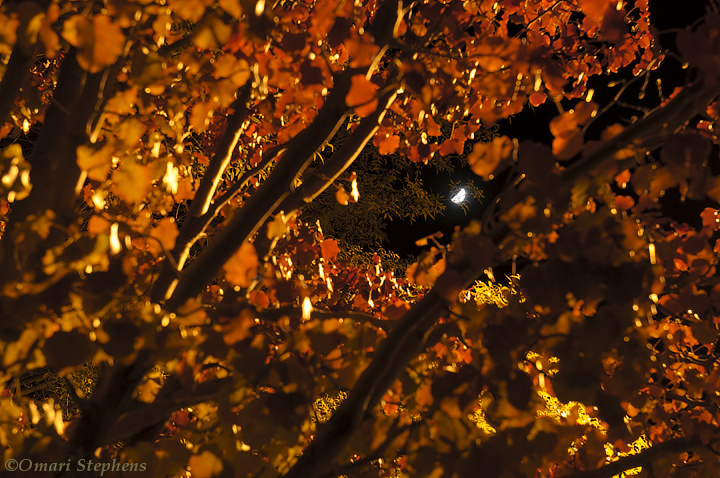 The near tree pretty much forms a reddish frame, and the moon invites you to look through the frame at the other leaves lurking in the back. The yellow highlights on the branches also create a subtle connection between the yellow tree and the red one. And back to the... uhh... green? So yes. In situations like the night-time when there's no real white reference, it's hard to figure out what colors should look like. This is doubly applicable when the main light source is clearly not white. I went back to the "yellow" tree, and my camera happened to shoot something that looks olive-green this time. I sort of like it. And given that arc lamps aren't really known for their color-accuracy and that half-an-hour had passed since the photo above, it's entirely plausible that the light color simply drifted. 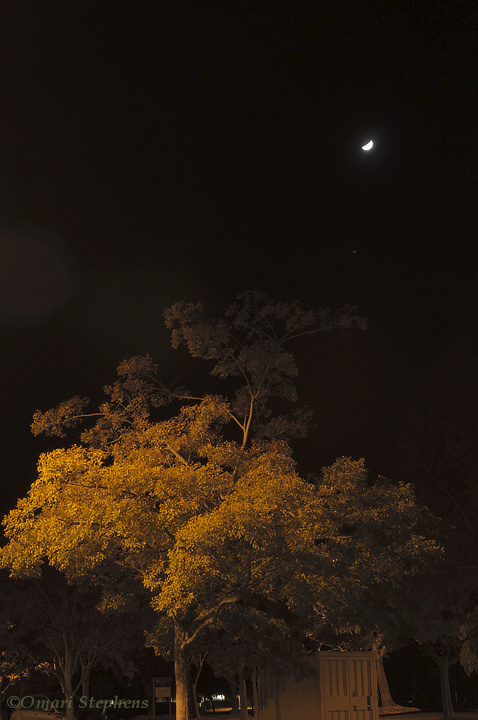 The reason I returned was because I wanted a photo of this tree that included Jupiter. 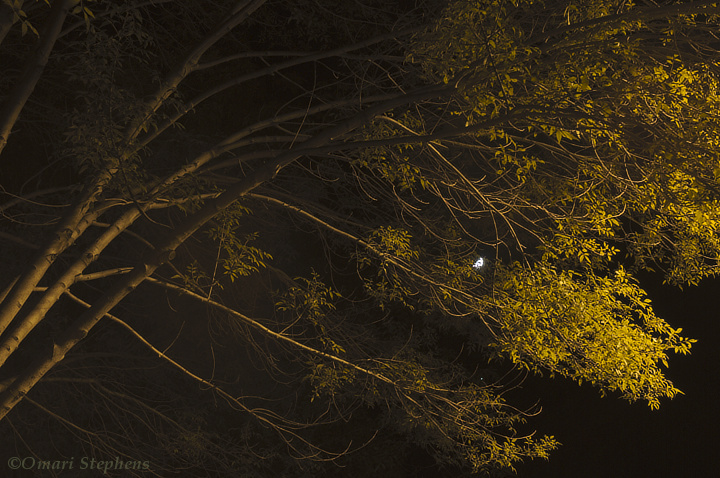 To make sure Jupiter didn't disappear, I shot more toward the outside of the tree, and with a longer focal length. With this image, I really enjoy how the colors accompany the geometrical juxtapositions — the thick and thin arcs of the branches are a drab olive-brown; the speckled blobs of leaves are more of a greenish mustard-yellow; and the small, intense areas of light coming from the Moon and from Jupiter are essentially white. You get the point, it's an iterative process, and there are usually a bunch of things that don't work before I find something that does. That challenge is one of the motivations that drive me to keep doing photography — I want to take something that doesn't work and make it work. I want to struggle to capture the world around me in ways that are real, but that you still might not see every day. I want to revel in the discovery of something extraordinary lurking in something ordinary. As billionaire Warren Buffett offered during a town hall at Columbia University, "Find what turns you on. Find what you have a passion for … I will guarantee, you will do well at whatever turns you on. There's no question about that. Don't let anybody else tell you what to do. You figure out what you are doing." Loved picture #3 through the red leaves and nice writeup! It seems like different folks I've talked to have had different favorites, so I think it was a pretty successful selection of photos.